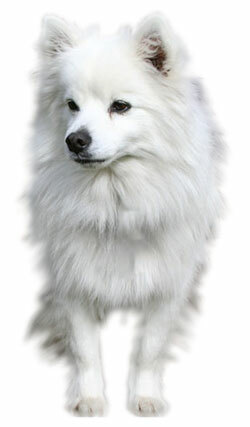 The "Eskie" is 12 to 15 inches tall (to shoulders) and weighs 10 to 17 pounds. He has a medium length, thick, double coat which consists of a dense undercoat and a harsher top coat. His coat comes in pure white and biscuit cream. The dead hairs in his coat naturally fall out. He also comes in two larger sizes, the Miniature American Eskimo Dog and the Standard American Eskimo Dog. The Toy, Standard, and Miniature American Eskimo Dogs are all identical except for their size, the Toy being the smallest.